What is it about humans that distinguishes us from the rest of the animal kingdom? Is it our upright walking? Our language? Our love of Reality TV? Even though we are said to be 99% genetically identical to our closest evolutionary relative, the chimpanzee, we clearly differ vastly from them physically and behaviorally. For many years, scientists have attempted to understand how our species came to be so different from any other on the planet. In the October issue of Nature Reviews Genetics, scientists at the UCLA and the Howard Hughes Medical Institute examine recent research to understand how genetic mutations have set us apart from our nearest relatives. In addition, they discuss how these genetic changes relate to the vast array of physical and behavioral differences that also have to be considered to fully understand what makes our species so unique. The authors begin their examination of human uniqueness by focusing on the overall genetic differences between our species and chimpanzees. Many years ago, research revealed that humans and chimpanzees are remarkably similar in terms of both genetic and biochemical structure. Scientists hypothesized that because the two species are so structurally similar, the differences between humans and chimps would turn out to be primarily in the way that genes — and therefore proteins — are expressed. Further analysis confirmed that there is only a 1% difference in overall genetic and biochemical structure between the two species – a number many people still cite today. However, the authors argue that more recent analysis has actually shown that deletions and duplications of DNA in both species bring the genetic difference between the two to about 4% across the entire genome. These and other findings have, according to the authors, “dashed the hope that it would be simple to determine the key genetic differences between humans and closest evolutionary relatives, that is, the genomic aspects of ‘what makes us human’ ”. One key difference between humans and chimpanzees is the difference in brain size. Humans have an average brain volume of about 1500 cm3, which is roughly three times the size of a chimp’s. While having a comparatively large brain was one of the most important factors in the evolution of our species, it has also resulted in an organ that is very expensive to maintain. In fact, many anthropologists have argued that in order for our large brains to have evolved, there must have been a simultaneous reduction in the size of other organ systems and muscle mass. In 2004, scientists discovered a gene, MYH16 that may have been involved in that trade-off between increased brain size and decreased muscle mass. Believed to be related to the growth of muscles in the jaw of chimpanzees and other apes, MYH16 has been mutated in humans so it remains switched off. Scientists hypothesize that the gene’s lack of expression in humans causes an eight-fold reduction in the size of muscle fibers in the human jaw. Interestingly, the timing of this mutation appears to have happened about 2 million years ago, when Homo erectus — the first of our fossil ancestors to exhibit a significant increase in brain size, evolved in Africa. 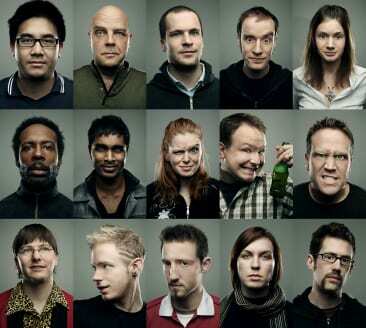 Sometimes referred to as “the language gene,” FOXP2 made a splash in the popular media when it was first described in 2002, because a very slight mutation in the human version is believed by some to have led to the evolution of language in humans. FOXP2 is not unique to humans. In fact, many species — including songbirds and alligators — have the gene, which is required for proper brain development. Though the human FOXP2 gene is slightly different, it has been found to be related to vocal learning in birds, and may even be tied to the evolution of echolocation in bats. In addition, new research has suggested that it may not be the FOXP2 gene itself, but rather a related genetic pathway, and it is that related gene that may be involved in the evolution of speech and language development in humans. At the moment the exact relationship between FOXP2 and human language remains unresolved – an illustration of the genome’s complexity. The authors conclude their review by proposing a method of examining human uniqueness from a genomic perspective in light of the fact that “traditional evolutionary biology approaches have yet to explain most of the unique features of humans.” They argue that in order to move the field of evolutionary genomics forward, and to truly understand what it means to be ‘human,’ there must be more of an effort to connect changes at the genetic level (our genotype) to changes at the physical level (our phenotype). Interestingly, questions of the relationship between genotype and phenotype form the cornerstone of 23andMe’s research arm, 23andWe.